A ton of folks have been asking us to continue making more of the Ancient Bog Wood Collector’s Sets. While we do not intend to make any more of them, as some of the woods are neigh on impossible to track down. And when you do find them, they are a real pain to work with. That said, after completing all of the collector’s sets for our first kickstarter, we have one extra set. I figured I’d offer it up to those of you that missed our first kickstarter. The woods included in the set are listed below. Everyone one of them spent a couple of centuries to several millennia buried in an ancient swamp, or sunk in the bottom of a river, or floating at sea. A really beautiful set! Sad I missed that one. Would love to hear about updates on Artisan Dice (and possibly more sets like this) but unfortunatelly the “Subscribe” button doesnt work (Chrome). Out of curiosity – how much did this set cost? Hi! 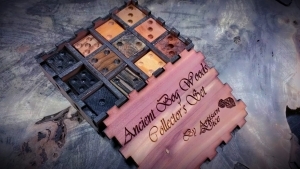 I’m very interested in your ancient bog wood collectors set for my closest friends 60th birthday. Could you let me know prices & measurements & a bit more detail on the pieces? I want something really special for her. She plays backgammon, cards & dice games but not online gaming. Don’t know enough about this to know if that makes a difference. Is all the wood been ethically/ sustainably sourced? Not sure what that means for bog wood but know it is precious so am interested. sorry paddy, but we no longer make these. the woods are too hard to source, and they are super finicky to work with. i’d be happy to put together something else for her birthday though. Did you do any Polyhedrons in any of the Bog woods? All I really need is a d20 or perhaps percentile??? We do, but you have to buy them in 10 dice sets. Hmmmn… all I can find on the site is Irish bog wood 6 siders.